If you get to go first (or no one else has placed there by your turn) and have the corn available, place all three of your workers on the Uxmal track in the 0, 1, and 2 spots. You will be able to pick up your next three workers in the next three turns, setting you up to be able to earn more resources later in the game. You might have to go into the negatives on the first food day, but the advantage of having those extra workers quickly will be worth it later. Never forget that in your turn you must at least place one worker or remove one worker, you are never allowed to pass. With that in mind, next thinking is obvious: if you have no workers to place you will be forced to remove at least one, if you have all your workers available you will be forced to place at least one. So now, start to think on a long term strategy for worker placement: try to make two or three rounds placing continuosly, even if that means placing one only worker: you are investing for a better actions. The same is valid also for removing. And when making this always consider the option to put a worker on the first player position just to make a double advance on the wheel if your will be removing workers on your next turn. Finally, once the game have started, try to not have all your workers in your hand unless you are removing them for a very good combo of actions. Long term strategy of worker placement, as its actions will be resolved in the future instead of on the turn they are placed like other games, is the key for this game. Neglecting the acquisition of additional workers early on can severely hamper your efforts in the mid- and late-game. Extending out beyond your initial three workers not only affords you greater options and flexibility, it also buys you time. With more workers in play, you can afford to let them sit longer, reaching the coveted “anything goes” action spaces. But beware the twin pitfalls of excessive workers: make sure you are stockpiling enough corn for the Food Days, and don’t get into the habit of placing three or more workers on a single turn… this will surely eat through your precious corn reserves. Stagger your actions and plan ahead. In the early game, Yaxchilan is the sole consistent source for crystal skulls, requiring four movements on the gear, or an outlay of corn to buy higher numbered slots. While this may suffice for an early bid on skull dominance, it alone is not an ideal path toward mastery. A focus on Tikal, with the intent of developing the Theology technology tract will provide greater skullduggery rewards in the long run. Not only will a fully-realized tech tree garner an extra skull from Yaxchilan, but continued use of the Tikal gear’s Action 1 and Action 3 spaces (assuming available resources at the ready) will permit the direct acquisition of additional skulls via Theology’s fourth tier. A well-coordinated assault on Yaxchilan and Tikal, with a fully-developed Theology tract, can net 5 skulls in one turn, followed up by quick placement onto Chichen Itza to secure the spoils of victory. One of the most critical decisions you make in a game of Tzolk’in is your choice of starting wealth tiles. Experienced players know that these tiles can guide or even set your strategy for the game. The default selection, especially for new players and players beginning the game as the last player, is to maximize corn, either through high corn yield tiles or the “1 worker fed” tile. Extra corn allows for flexibility and healthy buffer that allows newer players time to get used to the timing of the wheels. • If your draw includes a large amount of resources, this is good for a building/monument strategy or a temple track advancement strategy, or they could be leveraged for early technology track advancements. In general, wood is good for the technology track and the temple track, but stone and gold are more valuable and generally better for buildings or monuments. • Temple track advancements with corn and resources are usually a safe bet, since they come with decent amounts of both. Temple track advancements coupled with a technology track require more consideration, since they have lower corn and resource yields. • The extra worker is tempting but best taken when a high yield corn tile is also selected. This can be a dangerous choice if beginning last in player turn order. • If given the chance, advance two spaces on a technology track. This not only represents 3 resources saved, but also time on the Tikal wheel and possibly corn saved by not placing workers to take those actions. Depending on the track, this will provide less corn but will give resources and a temple track advancement. 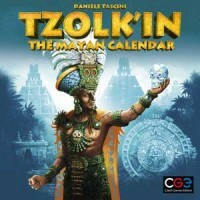 • The crystal skull tile is a solid choice overall and is perfect for a Chichen Itza strategy. This is especially true if your draw includes a Theology technology track advancement. In Tzolk’in your main resource is corn. You need it to place your workers as well as to feed them when four times per game. The more workers you have the more corn you’ll need to do this. I immediately saw this as a problem of not having it when I needed it. The tip I would give would be to make you you play on the Palanque gear early and often. Being able to grab that corn is essential. But beware the corn fields can be harvested out quickly because it is such a needed commodity. To help get over this make sure to upgrade the agricultural technology available. This will not only grant bonuses to the corn you gather, but the second tier allows you to harvest corn when there is wood covering it, without having to first harvest the wood or burn it down thus angering the gods. You can also harvest the corn on spaces where all the tiles have been removed. In the game you have Crystal Skulls that you first get on one gear and then “carry” to be placed in honor of the gods on another gear. Putting down a skull on the gear will give you points, favor on a temple and maybe a resource. If you manage to grab the skulls and placement gears early on you will have first shot at the 13 point + favor + resource slot and getting more is even better. This is a very simple and clean strategy as it only requires 1 skull and 1 placement. It’s a fragile strategy to go for the skulls as other players will often battle with you for placing the skulls, but going in early can be a surprise move and can net you some really nice early points. At the time of publishing, this is the 3rd tip and the 3rd that talks about the importance of corn…THIS CANNOT BE UNDERSTATED! One of our players tried to start early with a skull and ride the blue gear to get there first, she started with MUCH less corn than the rest of us, and she REALLY struggled to get anywhere. Start with a good amount of corn and you’ll be able to build everything up easier. Your gears look like this out of the box. Paint them! Just think how much better this game can be with fancy painted gears. Even one-color gears add a lot to the aesthetic over the stock tan. I do place the 1- and 5-corn tokens on the main Tzolk’in gear, but I find that the instruction to allocate the “first player” corn to the teeth as turns progress is rather cumbersome, particularly when playing with the Tribes & Prophecies expansion and the Quick Action tiles. Instead, I place the corn on the board near the First Player spot or, better yet, in a small container at that spot (I use small wooden bowls for all the resources). It’s easier to see; easier to grab; and doesn’t keep falling off the gear. • Limit to 9 buildings (including monuments) per player. If a player wants to build a 10th, the player must discard a building first so the total does not exceed 9. • Limit to 1 monument per player. If monument building were a viable strategy in itself, this might be objectionable. But multiple monuments doesn’t fly for any strategy except resource-tech anyway. • Double the VP penalty for not feeding people to -6 VP per unfed person. This handicap is more equal-opportunity, but it can discourage a resource-tech player from absorbing the feeding penalties the first food day or two. • Increase the VP penalty for angering the gods and dropping onto the negative VP steps. Instead of -1/-2/-3, bump to -4/-5/-6. Again, more equal-opportunity. It discourages begging too much to compensate for ignoring corn otherwise, which is common with resource-tech.